Back in the 90s comics took huge risks in getting more readers. The first one I can remember was the Death of Superman. Later on Marvel had a storyline in which Charles Xavier (the founder and leader of the X-men) was killed before forming the school and team. The X-men were formed but by Magneto, in honor of his friend. Apocalypse (a major baddie) took over the world and ushered in a dystopian world named "The Age of Apocaylpse". The regular X-titles were all discontinued and new titles were put in their place showing you how things are under Apocalypse's rule and Magneto as the leader of the X-men. That brings us to Wolverine (known as Weapon X) who never joined the X-men but was in a relationship with Jean Grey. They both fought against the forces of Apocalypse and in one occasion squared off against a bad version of Cyclops (Who was raised by Mr. Sinister). It led to Wolverine losing his left hand and Cyclops losing one eye (ironyyyyyyy). In one of the better reveals, Weapon X fights against this dude who thinks he's got Logan against the corner and claims his victory. This is when Logan says something like "I lost my hand, bub....not the claws!" and that's when he runs him through. 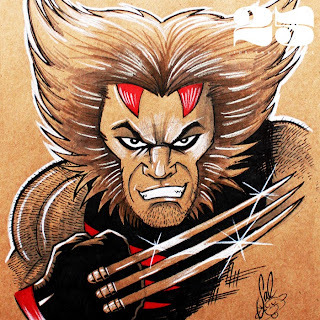 It was an awesome moment and although I like the regular Wolverine (even though he's been prettied up in the comics because of the movies), I decided to draw the AoA version. He's more of the savage, short dude with the long and crazy hair. Weapon X is up in the store if you want to claim it. Thanks for reading and happy 4th of July!